Visit the amazing African safaris on Hot Safari Scratch at Moon Games! This creation of Pragmatic Play offers a beautiful view of the savannah where you can see a majestic lion. A bright sun is shining in the sky, creating a yellow glow and a pleasant atmosphere. The game is set on a 3x3 grid on which you can see symbols like the Lion as well as different prize values. Launch this brilliant game on any type of device. 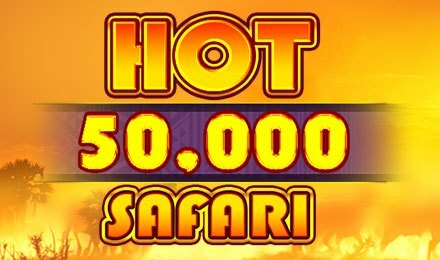 Start your gameplay on Hot Safari Scratch by selecting a set number of games for a ticket price. Once done, either swipe the grid with your cursor or hit the Scratch tab to reveal the symbols. Match a minimum of 3 symbols to trigger a payout. The maximum you can win on this game is £50,000! View the potential payouts by clicking on the Paytable button. An Auto Play feature is also present to let you enjoy several games played in rapid succession. Click on Stop if you wish to cancel it at any time. Amount of Paylines Selection: No lines are available on this game. Coin Values: Hot Safari Scratch comes with a set ticket price of £0.50. When at least 3 Lions appear on the grid, you can enjoy a Free Play added to your remaining tickets. Enjoy a 5% discount when you opt for 25 games. Go for 50 games to get 50% off. Ride in the African plains and enjoy a unique gameplay on Hot Safari Scratch at Moon Games. Good luck to you!